My FAVORITE Disney movie as a child was Sleeping Beauty! The incredible medieval inspired backgrounds, and Tchaikovsky’s amazing score? just lovely and oh so magical! So I was SUPER excited when Disney announced they were releasing Sleeping Beauty Blu-Ray and DVD! So Parties start with a theme, right? 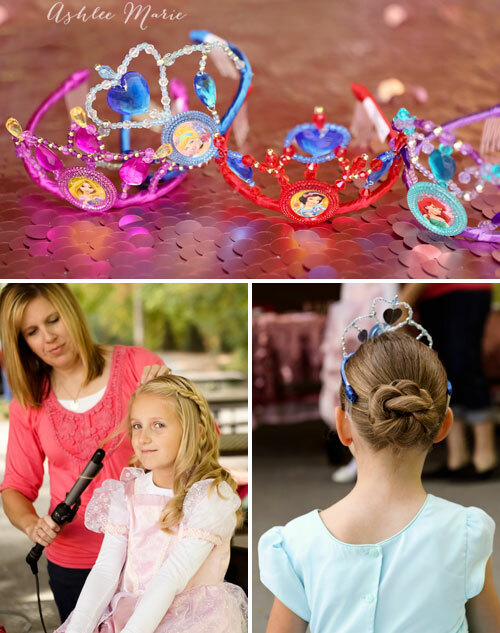 A Royal Princess SPA party was perfect! Totally girly and fun, and hand on. For the colors I went with classic Princess color, Pink, more Pink, Purple, Blue and Yellow. When I was shopping I noticed the Chalkboard wrapping paper and thought… BACKDROP! As usual I went BIG and I’ll be sharing full tutorials and recipes all week long. I started by making a list of the Princesses and coming up with food items for each of them. 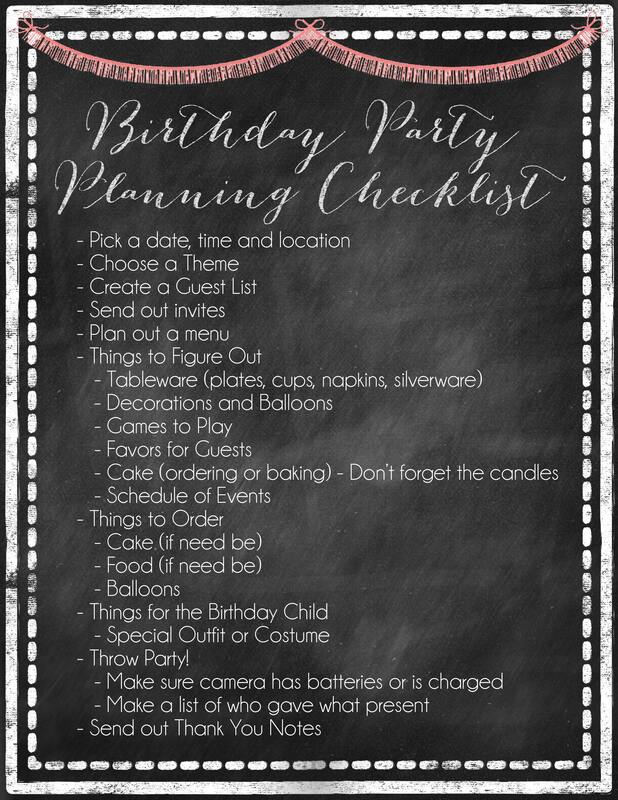 I think I enjoy the party planning and brainstorming more than the actual party itself sometimes (although I do love seeing the party come together so that’s not totally true). I made the most AMAZING Biegnets for Tiana, seriously just like Downtown Disney… The batch made a ton and my kids ate the extra’s all day (even good cold). 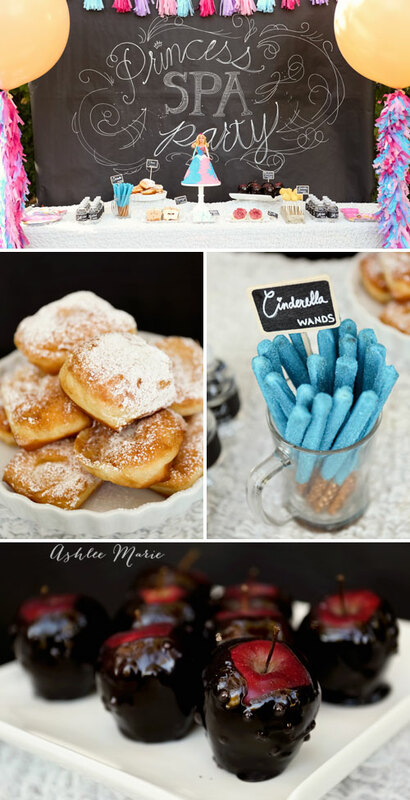 Then of course Blue Magic Wands from the Fairy Godmother in Cinderella (the kids love helping dip the pretzels) and my MOST favorite “poisoned” apples from Snow White (actually candied apples, the kids didn’t love them but the adults did). Princess and all her Royal guests were THRILLED with the party! It was so fun seeing them all dressed up and having so much fun. 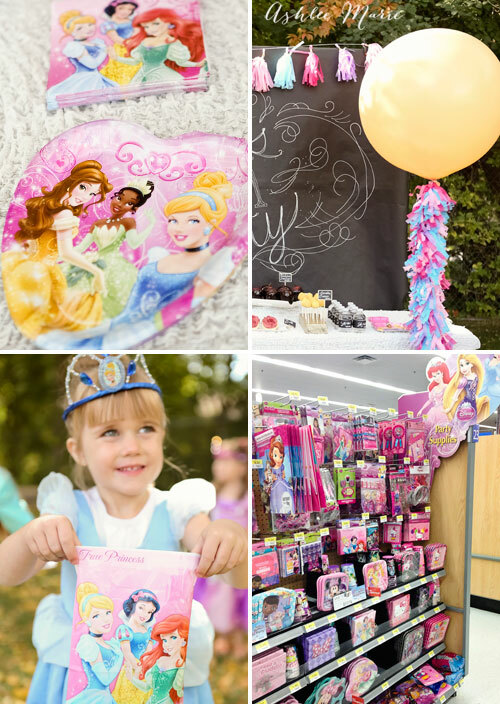 I love the JOY in little girls eye’s at princess parties, don’t you? For Merida I wanted to come up with something representing the Will O’ the Wisps, so pretty blue and glowy and floaty… but what? I made Cotton Candy Divinity candies! 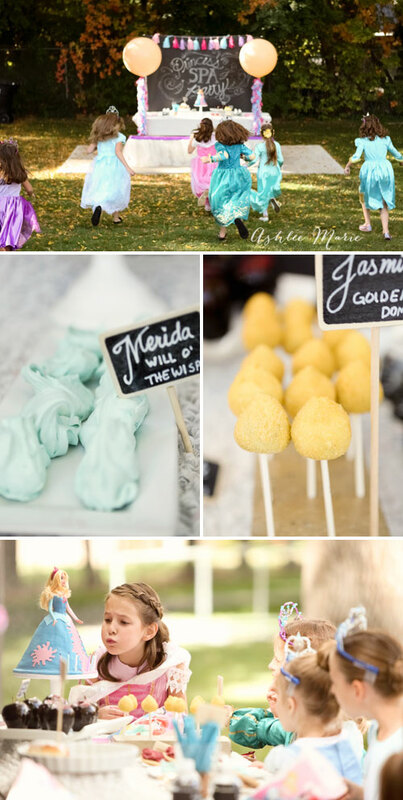 And I think Jasmine was the HARDEST one to come up with a fun food for. I finally settled on Golden Domes… I know it’s a stretch… The golden dome tops of her Castle? Made from Oreo Truffles. I am embarrassed to admit I totally forgot about Rapunzel! WHAT? There are SO many fun foods you could do for Rapunzel… But realizing I forgot about her the night before meant scrambling… I had a Castle sandwich cutter so nutella Rapunzel’s Castle it was! Doing a ROSE for Belle was obvious, but WHAT kind of rose, cake pop? strawberries? I decided to go with Rosette frosted Sugar Cookies, they turned out SO pretty! And Arial was easy… Water bottles! Since I was going with Chalkboard signs I used some of the Chalkboard wrapping paper and wrapped them around the bottles and used a chalk pen from My Minds Eye for the writing! I have ALWAYS hated my handwriting but I’m in the middle of a Calligraphy class from IStillLoveCalligraphy.com so I decided to go for it, I still have a long way to go, but it had the feel I wanted! 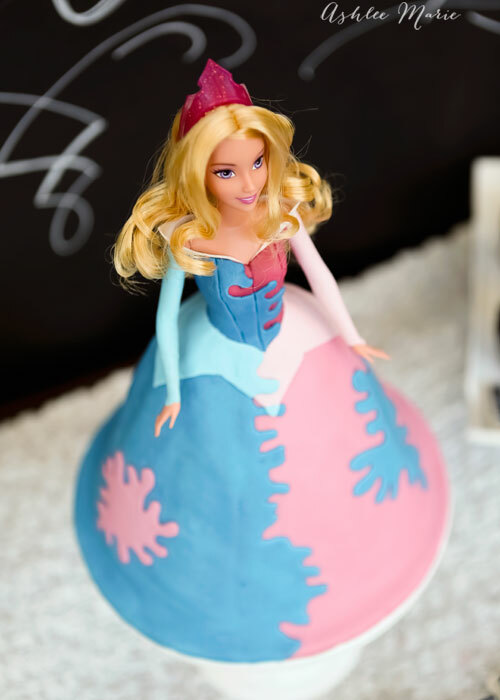 And the STAR of the show… Sleeping Beauty herself as the cake! The big debate with Aurora is always BLUE or PINK dress! So while she never wore the splattered dress in the movie (or even SAW it) I thought it would be fun to do for the cake. Something that I hadn’t seen before and brings more color onto the table. Now for the SPA part! My sweet blogging friend Becky from Babes in Hairland brought her sweet daughter and did all the girls hair! I bought all the Princess crowns they had at the store and she created such fun hair designs. Even MY Princess, who HATES having her hair done, Sat and enjoyed the whole experience! I can’t wait to get Becky’s book (and I’ll be trying some styles and doing a review here next month)! And no Spa party is complete without creating a wonderful bathroom product to take home, right? 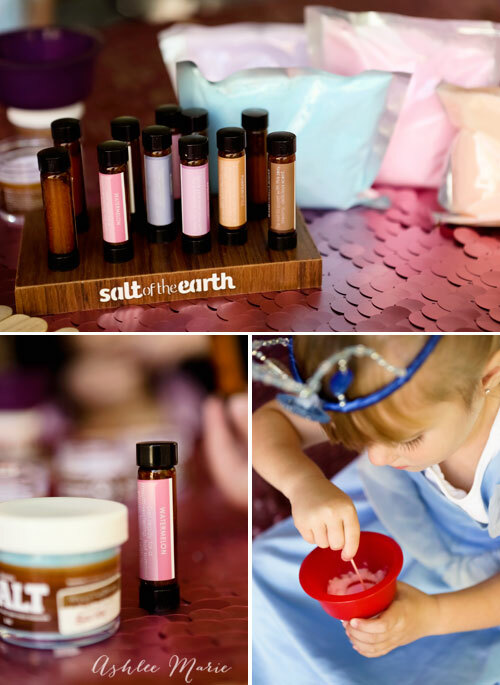 Salt of the Earth donated these awesome 2 oz bottles of colored bath salts and amazing scents (the most popular scent was the pink cookie) for the girls to mix and create! My daughters have already taken 2 baths and love it (if your interested in spa products they are currently offering 40% off using the code “saltyparty14”)! And of course we had to do nails!!! The girls loved these cute little mini nail polishes! 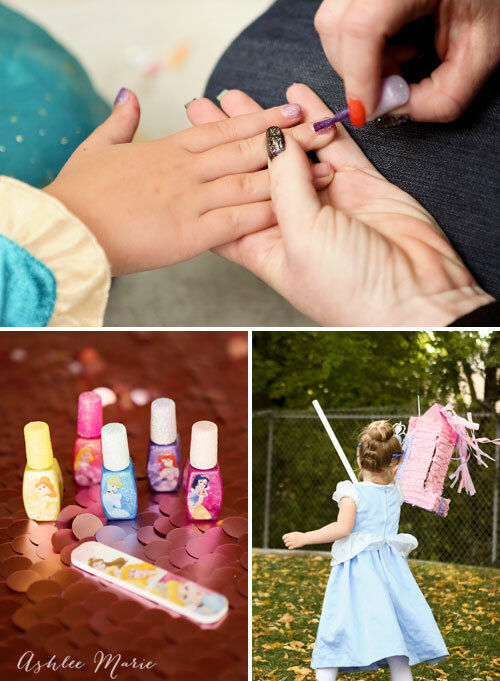 They struggled picking colors, because they couldn’t decide if they wanted to go with their favorite color (pink usually) or their favorite princess! And you guys know how much I love pinata’s! This is actually our 2nd pinata in a week (we had one for Baby Boy’s 3rd birthday too). Who doesn’t love pinata’s? and watching these little girls try to break it is ALWAYS hilarious! I was worried about the weather in Utah in October, but this park was just too perfect (Hello, Cinderella’s coach?) so I crossed my fingers and went for it! And it’s a gorgeous park, with lots of grass, trees, etc… And of course we couldn’t celebrate the release of Sleeping Beauty from the Disney Vault without having the movie playing! So who is YOUR favorite Disney Princess? And what recipe or tutorial are you the most excited to see this week? Mmmmm going through my blog comments always reminds of recipes I haven’t made in a while, now I want beignet! Simply gorgeous! 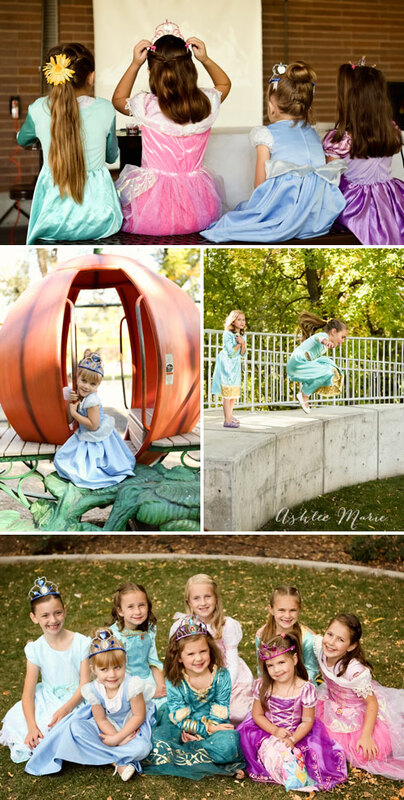 This entire party is every little girl’s dream come true! HA! Babes in hairland is a doll! do you have her new book? I just did a review on it, its GREAT! and thank you so much! It was a fun party to design and throw! Such an amazing party! So well done and thank you for using our Salt of the Earth products in them. Glad they enjoyed the custom blending. I have a 5 year old daughter and she would have just died to experience something like this! Wifey is going to have to step up her party game. Thanks for the inspiration! Thank you so much! And anytime your wife wants help with a party i’d be happy to come by and advice! I love helping mom’s throw parties for their kids, it’s my favorite thing! Oh it all turned out fabulous. Thanks so much for having us come and letting us play a small little part in this amazing party! You are seriously the bomb! It all was simply wonderful and “Bee” hasn’t stopped talking about it. Thanks again for inviting us! I’m so glad you could come, thank you for your major assist! I’m glad your sweet girl had fun!